The process of cooking with wood has been around for centuries. Using wood gathered from local forests to either cook or flavor our food is something that most people find interesting and exciting. Wood offers us the opportunity to get creative with our cooking. The natural flavors found within the smoke or sap can give you a taste that no over the counter spice can offer. It can be as simple or as involved as you want to make it and you don't have to be a master chef to enjoy the benefits. Using a grill or cooking over a hot bed of campfire coals is an experience everyone should enjoy. Not quite sure if you're ready? Don't worry......we'll walk you through some of the basic steps to get you outside and enjoying a great tasting meal or snack in no time. Okay, so you're ready to try this whole cooking with wood experience but maybe you're not quite sure what type of wood to use? Well, the good news is you have a lot of options. If you've ever been camping before you know that no camping trip is complete without a campfire. 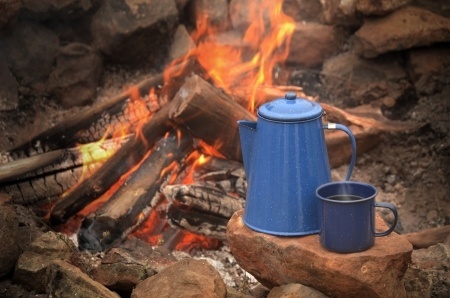 The sights, sounds and smell of a campfire are almost a necessity to any camping experience. Campfire Cooking can be a great way to enhance your camping experience and give you a great tasting meal or snack in the process. Looking for a few ideas? Click on one of the links for more information. Cooking With Skewers - These long metal objects allow you to cook hotdogs, marshmallows and many other items over the campfire. We'll give you some tips and tricks to create a tasty snack or meal. Smores Recipes - An old fashioned favorite with a new twist. You can get pretty creative with a smore. Here are a few recipes you need to try! Looking for a new way to make smores? Read here to learn about a smores grill. Dutch Oven Cooking - Dutch ovens are becoming very popular. Learn what they are and how to use them to create a great meal. Campfire Pie Iron - No camping experience is complete without having a cherry or apple pie cooked in a pie iron. If you haven't tried it yet......you should. Do you have a new pie iron or need to season a piece of cast iron cookware? Read here to learn about seasoning a pie iron. 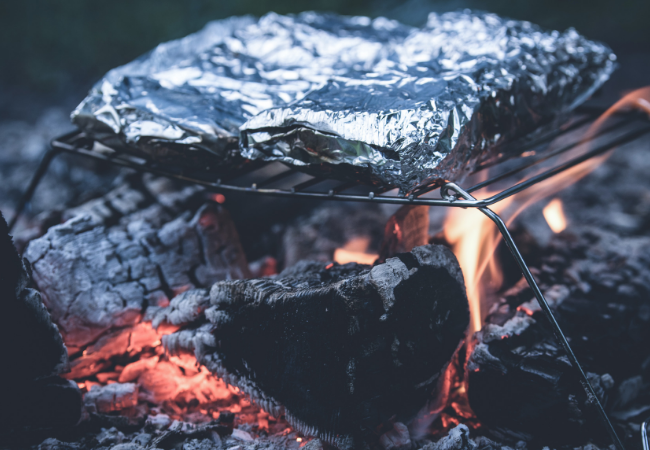 Campfire Foil Cooking - From baked potatoes to lemon pepper fish, using foil can allow you to cook almost anything. Campfire Popcorn - Popcorn might just be the perfect late night snack when your sitting around the fire. Read here to learn how to pop a perfect batch of popcorn. Campfire Grill - If you're looking to grill hamburgers or cook something over the open coals, a campfire grill will work great. Find out what they are and how to use them. Cooking Fish Over A Campfire - Learn how to create the perfect campfire meal......fried fish. We'll explain how to fry up a batch of tasty fish filets!